Our Fastest Hosting Solution With Dedicated Resources For Your Website. Dedicated Servers hosted in Toronto, Canada. The Ultimate In Power, Performance, Security & Control At Your Finger Tips. We'll handle the migration from your current provider. We'll move your entire website on to your new Server seamlessly. Each Dedicated Server comes with CSF and LFD firewalls, brute-force detection, mod_security and a real-time virus scanner. Your Dedicated Server will be connected to the Internet at 1Gb/sec on one of our 3 premium Multi-Gigabit network backbones. Managing your Server is simple with WHM. 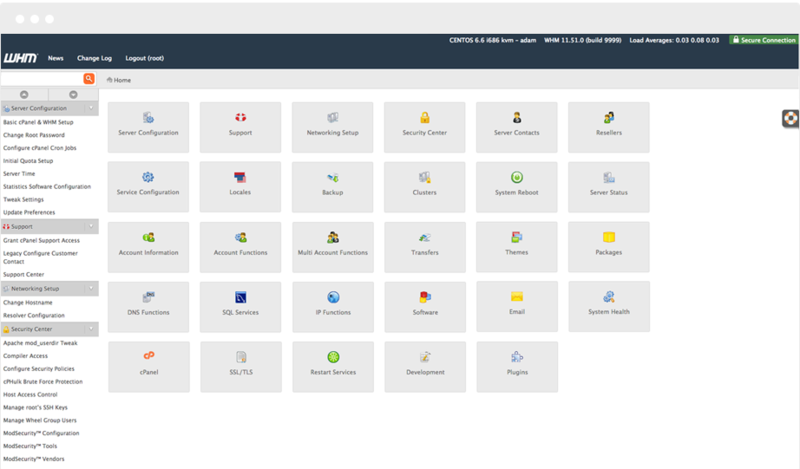 You can use WHM's interfaces to manage accounts, email, and software on your server. A Dedicated Server at HostUpon means you will have your own physical server in our data center. The server is exclusively yours and you have full control over the operating system, control panel and every other aspect of the server. No sharing of resources or disk space and no contracts. A dedicated server means you have FULL root access and can install anything you wish. Does HostUpon manage my server? Our dedicated servers are semi-managed. This means we'll keep the server-side modules current and updated. This gives you the freedom to install anything on your server and run your site without having to maintain server-side modules. "You guys rock! Our dedicated server is fast and with the help of your support team our live video streams work flawlessly. I chose HostUpon because you're Canadian and specifically wanted a server in Canada. I've recommended you to my colleagues and hope you keep up the amazing support I've received thus far."